JOHN A. DONNELL in 1894 became the first Los Angeles County district attorney to be elected to a four-year term. A term of that duration was created by the County Government Act of 1893, applicable to all county and township offices. DAs were previously elected to two-year terms. Donnell’s single term was to last from Jan. 7, 1895, to Jan. 2, 1899. Running as a Republican, Donnell gained the office after having been spurned in the two previous election years in seeking his party’s nomination. As recently noted here, at the Republicans’ Oct. 3, 1890 county convention, James McLachlan received 236 votes to 96 for Donnell (and 25 to Jesse Hardesty). McLachlan was elected that year, and proceeded to assume responsibility for all of the county’s civil litigation. This meant a drop in income for the law firm of Campbell, Houghton & Silent, which had up to that time been hired as a contractor to handle much of that work. Charles Silent—who might be termed the “Silent partner” of the firm—nominated Donnell for district attorney at the 1892 GOP convention, in impassioned oratory, citing charges of whitewashing by McLachlan alleged in the Democratic morning daily, the Herald. McLachlan gained the party’s nod by a vote of 176 to 141½. On motion of Silent (a former judge of the Supreme Court of the Territory of Arizona), the vote was then made unanimous. George Holton had been the first Republican elected as district attorney in the county, gaining that distinction in 1884, but losing the office two years later to Democrat George Patton. Edwin M. Meserve was a founder in 1889 of Meserve, Mumper & Hughes, and became president of the Los Angeles Bar Assn. in 1920. Burdette was to serve as a bar association trustee in 1903. Appel, who did not wind up being nominated, was later to help defend trial lawyer Clarence Darrow on a bribery charge related to his defense of two brothers charged with bombing the Los Angeles Times Building. The Republicans held their convention on Sept. 7, 1894, earlier than usual. The lion’s share of votes went to Donnell; they numbered 330½, according to the Times, and 302½, by the Herald’s count. The papers agreed that there were 95 votes for Meserve, 53½ for Burdette, and 27 for Holton. The county Democrats held their convention a few days later. On Sept. 12, E.C. Bower was nominated for district attorney, beating out a former DA, J.R. Dupuy, on a vote of 352-292. Bower was already a candidate in the general election, having been nominated on July 26 by the Populists. Two years earlier, the Democrats had also piggy-backed on the Populist ticket. The county Democratic Party, whose nomination was once tantamount to election, was in decline, while the “People’s Party” was in the ascent…but never ascended high. So active was Trask in promoting Bower’s candidacy, that he publicly challenged Donnell to debate him. That’s right...debate him, standing in for the candidate. A debate did not take place. 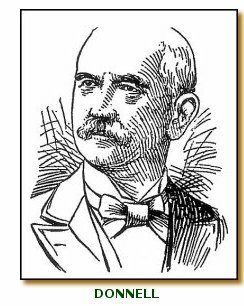 Dummer K. Trask was appointed to the Los Angeles Superior Court on Dec. 28, 1898, by James Budd—the last California Democratic governor for 40 years—and served until his term ended on Jan. 7, 1901. “For sometime it has been rumored that the Democratic conventions held and the nominations made by them in the new Turnverein Hall were illegal at both the county and city gatherings. The conventions were held on the second floor in the large hall. On the same floor and only a few steps from the auditorium, a pro tempore saloon was in each case established, there being direct communication between the hall and the saloon, and people could plainly be seen drinking in the saloon from nearly every part of the hall. One of the city’s “leading attorneys”—who was not named—is quoted as predicting that if any of the Democratic candidates won, the legality of his holding of office would be tested in the courts. “A good deal has been said by Maj. Donnell’s friends and organs about the former’s superiority professionally to Mr. Bower. Assertions of this character can be laid only to absolute ignorance or pure mendacity. They didn’t. Donnell captured 12,161 votes; Bower got 9,037; the Prohibitionist contender, F.M. Porter, received 1,720. The Herald’s approach to reckoning a lawyer’s worth by the number of cases he or she has handled, without consideration of the complexity or nature of the cases, is obviously superficial. Nonetheless, if the counting of California Supreme Court cases handled by the two candidates were to be undertaken, it’s readily ascertainable now by a check of Westlaw that the first case in which Donnell represented a party in the state high court was decided June 16, 1891; between that case and the one closest to the 1894 election—decided March 1, 1894—Donnell had represented a party in six more cases before the California Supreme Court, for a total of seven. The Herald alleged that “Mr. Bower has had five times as many cases in the supreme court in two years as Donnell in eight years.” Did Bower have 35 cases in the California Supreme Court in the two year period preceding the editorial? Back then, not only could a lay voter not have been able to ascertain the falsity of the Herald’s proposition, appearing the day before the election, but an attorney would have had a formidable task in checking up on it. That would have required going through every decision of the Supreme Court, in book form, for the past two years to see the number of cases Bower had argued and for the preceding eight years to determine those Donnell had handled, and somehow finding out how many cases each had pending in the court. The difficulty of verifying representations in those days inured to Donnell’s benefit, in a different context. As you’ve seen from the quotes above from newspapers, the title of “Major” generally preceded his moniker. It would seem that no one questioned that he had, in fact, been a major in the Union Army. But he hadn’t. Civil War records, now accessible electronically, show that Donnell’s rank when he was mustered out on Sept. 24, 1864, was actually that of adjutant lieutenant, a notch below a major. He served in an Iowa cavalry regiment. In the next column, I’ll tell of his somewhat troubled term as district attorney—which included an order by a judge to show cause why he should not be tossed out of office and brickbats from the Los Angeles chief of police.